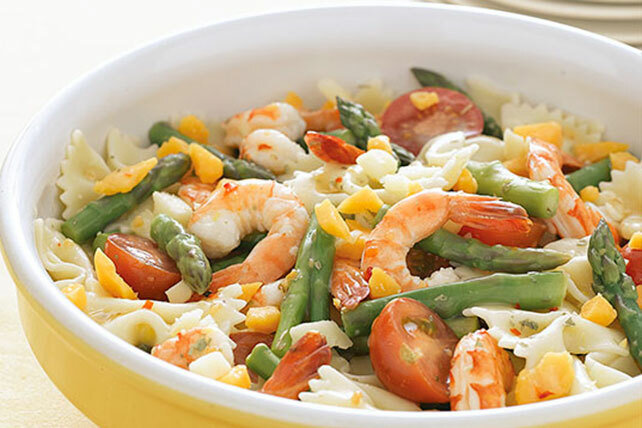 Serve up an inspiring weeknight dish with our Lemon-Shrimp Pasta Salad. This Lemon-Shrimp Pasta Salad is enhanced with lemon zest and vegetables. Cook pasta in large saucepan as directed on package, omitting salt and adding asparagus to the cooking water for the last 3 min. ; drain. Rinse with cold water; drain well. Mix dressing, oregano and zest. Place pasta mixture in large bowl. Add dressing mixture, shrimp, tomatoes and cheese; mix lightly. Prepare as directed, omitting the shrimp and increasing the tomatoes to 2 cups. Substitute 1 lb. cleaned uncooked large shrimp for the cooked shrimp. Cook shrimp with 1 Tbsp. KRAFT Zesty Italian Dressing in large nonstick skillet on medium-high heat 3 to 4 min. or until shrimp are no longer pink, stirring occasionally. Continue as directed. Pasta salad can be made ahead of time. Refrigerate up to 24 hours before serving.